Holders of international credit cards (Visa, Mastercard) have the ability to withdraw money from the ATMs. These ATMs distribute Kenyan Shilling (KES) banknotes. Bank branches and foreign currency exchange services are present in the differents halls and terminals. Several lounges (the Pride lounge and the Simba Lounge) are available to travelers boarding a flight departing from Nairobi JKIA. Access is restricted to first-class and business-class passengers of certain airlines, to cardholders and to passengers paying a one-time entrance fee. These lounges offer comfort, service and tranquility to discerning travelers. Bar, newspapers, armchairs, wifi connection, computers, kiddy zone and television will offer you to wait for your boarding in the best conditions. Kenya has several 3G operators selling SIM cards without subscription and 3G USB sticks for a cheap and fast internet access on your PC, tablet or phone. These SIM cards are available and can be activated in several shops in the airport. The terminal also has several wifi spots including that of the VIP lounges. To send letters, postcards and parcels, for purchases of stamps and for receiving and sending money orders, the Postal Corporation Of Kenya (PCK) office of JKIA is open. Nairobi Intl. Airport is always concerned about the safety of passengers and aircraft. The police of the airport listen to all travelers. Security officers also ensure compliance with international standards. You can call them to report any suspicious activity. In addition, we remind you that leaving luggage unattended can cause its destruction and prosecution against you. 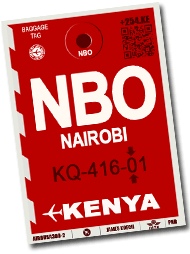 To strengthen and protect your luggage from bumps, scratches or theft, a paying luggage wrapping service is available in the check-in area of Nairobi-Jomo Kenyatta airport hall. Uses strong plastic film to protect against handling damage and to prevent items being inserted or removed. The fixed price is KSH1000 (US$10) per bag packed. Each airline flying to Kenya impose a different baggage allowance. It is important that every traveler comply with those rules under threat of being required to pay excess baggage fees that can be prohibitive. It is therefore recommended to weigh your luggage before you get to the airport. However, it is possible to weigh them on the balances available at check-in counters in order to lighten them if necessary. To ensure the comfort of its passengers and visitors, Nairobi airport offers a medical service for health emergencies and a pharmacy open 24/7. In case of loss, theft or damage related to luggage carried by travelers, you're advised to check withthe Lost & Found baggage office located at the JKIA Arrivals Building. Nairobi airport has bars / restaurants, independant or operated by Servair Kenya in the main hall and in the boarding area. You can eat there or consume various beverages, soft drinks and mineral waters. - THE KARIBU CAFE is conveniently situated at the International Arrivals for those waiting for passengers to arrive. This lounge offers Dorman’s coffee, affordable snacks and a buffet lunch service. - THE SAFARI COFFEE SHOP is located at the Domestic Departures lounge and ideal for that short break or quick beverage prior to boarding your flight. The Safari Coffee shop also offers Dorman's coffee and affordable snacks for passengers before they board. - THE KWAHERI SNACK BAR is a convenient self service cafe located near gate 4 in International Departures, offering various snacks, hot meals and beverages. - THE PUB is an ideal place to unwind and share a light drink with friends and family before a flight. Located adjacent to the unit 2 check-in area, it offers both local and international drinks and a range of snacks. - THE KENCHIC INN, Kenya’s premier fast food outlet, specializes in providing tantalizing meals for travelers in a hurry. It is conveniently located near the local arrivals gate. Short and long term storage is available for personal effects and luggage, through a secure counter facility. Customers using the luggage storage will be required to fill in documentation, provide a passport to be copied and sign a disclaimer. Customers wishing to reclaim baggage will be required to show ID and provide their receipt. The charges are KSH 300 or US$ 4 per bag per day. The facility is open 24 hours every day.